A strong family commitment, quality food, and lots of love. These three make for the perfect recipe – satisfied customers with memorable meals and gatherings. Our home is your home. Ski’s Meat Market. Ideal marbling, bright cherry red coloring and fine texturing … that’s what you can expect from your neighborhood Ski’s Meat Market beef selection. All of our beef products are 1855 Brand Premium Black Angus. Only 13% of all cattle qualify for the 1855 Black Angus brand. Our premium brand, 1855, is only available in fine establishments. 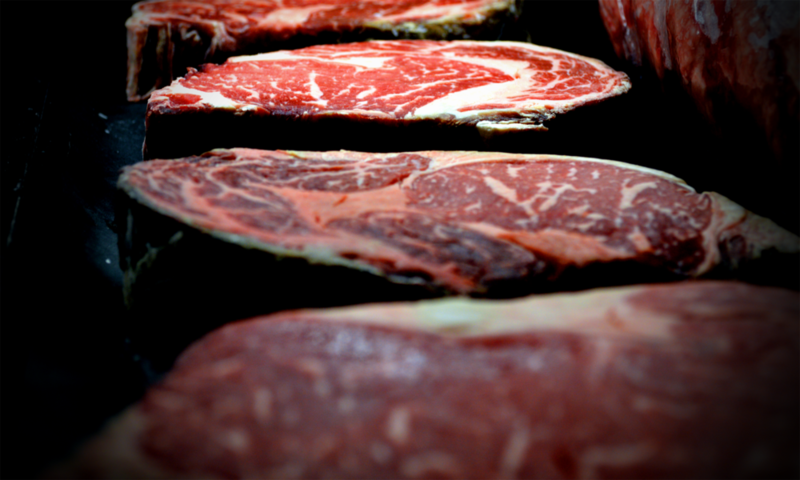 This top-of-the-line beef comes from a distinguished herd of cattle. This herd consistently produces the most tender, juicy and flavorful beef. Our 1855 beef selections are aged a minimum of 14 days for maximum tenderness, another key element to an incredible dining experience. Experience for yourself; the unforgettable, deliciously tender, juicy beef cuts that our customers demand and receive at Ski’s with consistency second to none. Ski’s Meat Market carries only Sterling Silver Premium Pork. Raised in the heart of pork country on Midwest farms, all Sterling Silver Premium Pork cuts are hand-selected and color-graded to ensure premium quality and delicious, juicy flavor. Sterling Silver Pork has 50% more marbling and is 36% more tender than regular pork. It just doesn’t get any better. Sterling Silver All-Natural Premium Pork is 100 percent natural, with no added hormones, preservatives or additives of any kind. Following through with Ski’s policy of quality, we proudly sell Bell & Evans Chicken. Customers rave about the juiciness and tenderness of our B & E Chicken. All B & E chickens are raised without antibiotics throughout their life. turkey-logo-web They receive no antibiotics and no growth hormones in the feed, the water or even the egg…. EVER. They are fed an all-vegetarian diet; no animal by-products! B & E uses a slow chill process that is more effective in tenderizing the meat. Since their chickens do not depend on ice water for chilling, the chicken’s natural juices are not diluted in, or replaced by the water in a conventional water chiller. While in these conventional chillers, chickens may absorb 7 to 8% of their body weight in added water – and that may contain chlorine. the finest Alaskan king and Coho salmon from Triad Fisheries, domestic shrimp, fresh house made crab cakes and so very much more, fresh every week! Here in Wisconsin we are known for producing some of the best cheese in the country. 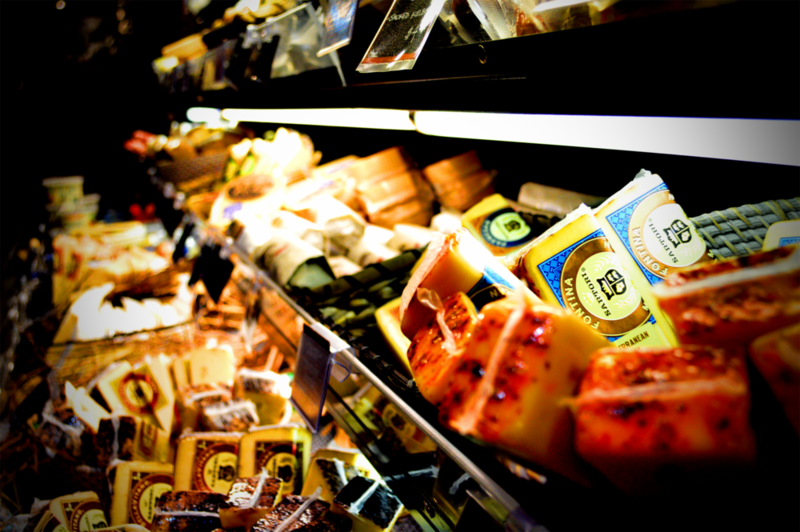 At Ski’s we feature over one hundred varieties of cheese produced right here in Wisconsin. Our sales staff will be happy to assist you in your cheese selection. Or maybe you would like us to create one of our artistic cheese trays for your gathering? Stop in to see our extensive selection of delicious Wisconsin produced cheeses and here is a sneak preview of some of the award winning cheese offered by Ski’s. You will soon taste the true labor of love these incredible cheesemakers have. With Ski’s philosophy of Food, Family and Love we couldn’t ask for more perfect partners. You won’t be able to miss what Ski’s is most known for – our homemade sausage selection. Sausages are being made fresh DAILY by our butchers and are a customer favorite. For a real treat, try them with a pretzel bun made right here in Milwaukee, Wisconsin. New brats are always in the works so keep an eye out for new flavors. Did you hear about our brat lunch deal for your office? Yes, that is right…. Do you have a promotion kick off, reward for job well done, employee camaraderie or a “Thank You” we appreciate you event? What could be easier or tastier? You simply pick them up. And more new ones all the time!!! Ski’s fresh deli salads are made in-house; no premixed bags for our customers. Stop in the deli to complete your meal with our wonderful offerings. We welcome you to taste any of our salads to ensure they are to your satisfaction. If you don’t have the time or energy to cook dinner, stop in and grab a quick and easy dinner that simply needs to be warmed up! Are you serving lunch or dinner to a group; call ahead and we will have it ready for you as not all items are available every day! But we will surely make it for your gathering.